A French judge has filed preliminary manslaughter charges against European aircraft maker Airbus over a crash in 2009. All of the 228 people onboard were killed when an Air France flight from Rio de Janeiro to Paris came down in the Atlantic Ocean on 1 June that year. The cause of the accident is not known, though sensors on the aircraft sent faulty speed readings to pilots. Airbus says no one can know for sure what happened as the so-called "black boxes", which monitored events during the flight, have not been recovered. Next week, a fourth attempt to find the voice and data recorders will get underway. The search involves dives to depths of up to 4,000 metres (13,120 feet) to examine the ocean floor between Brazil and West Africa. Special robots will be used in the search. "We are convinced if we find the black boxes we'll be able to reconstruct what really happened on this tragic flight," said Airbus chief executive Tom Enders. 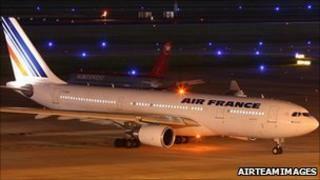 The search will be financed jointly by Air France and Airbus. The new search is estimated to cost $12.5m (£10.9m). The previous three searches cost $27.5m.